The title seems almost a misnomer but a look at work from three eras reveals some startling congruency between prints made in Paris during the development of Art Deco in the first quarter of the last century; and, in Halifax, theatre designs by Marjorie Tozer early in the second quarter, and later designs for street and stage by Robert Doyle in the last quarter of the century. 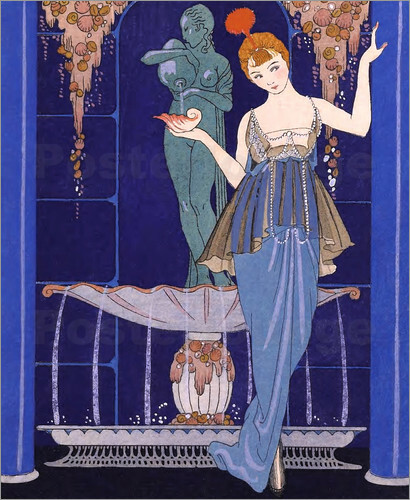 The exhibition has been made possible by the generous donation of many Parisian prints by Arthur M Smith, former Librarian at the Royal Ontario Museum, who prepared the exhibition 'Chevalier du Bracelet' : George Barbier and His Illustrated Works, for the Thomas Fisher Rare Book Library in 2013. The prints by George Barbier and his colleagues in Paris served an elite clientele on both sides of the Atlantic. In a changing society that felt threatened by industry and technology they took delight in classical Graeco-Roman, Baroque, and other historical periods, as well as the exoticism of the Ballets Russes. Living in a world increasingly overtaken by technology, Tozer and Doyle found expression in that same escape from the commonplace.